Edith used to make a Christmas cake every year and people often commented on how good they tasted... but she never weighed or measured the ingredients. She just knew how much to use. So one year Ros sat with her while she made her cake... and took notes... and then the following year Edith died. 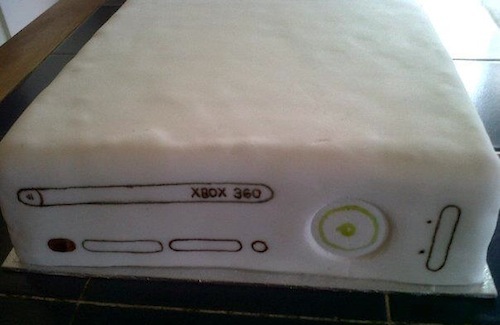 So that was the last cake Edith ever made. Ros has never had the heart to use the recipe herself but she gave it to me... and I've made several... and people often comment on how good they taste (we've even had a pro caterer ask for the recipe after I made one for an engagement party). soak the dried fruit in brandy for a day or two before doing anything else. Mix the dry ingredients (first 4 on list). Do it by hand so you can squish any lumps. Add the butter and treacle, and kneed it into a kind of dough to get all the lumps out. Mix in the eggs and stir until smooth. I usually use my hand so I can feel and crush any lumps. Drain the fruit (save the syrup - it's delicious) and mix the fruit into the other ingredients. You can mix in some of the syrup if you think the mixture seems dry... but it probably won't be. Note that most of the alcohol will cook out. The brandy is there for flavour. Finish off by halving the cherries and fold them in. They're added last so they don't get smashed to bits. Put the mixture into lined tin and put a piece of foil over the top to hold in moisture. I normally use a 9" square tin and the quantities above fill it to a depth of about 2.5". Bake on 150 degrees for 5 or 6 hours. I check it after 3 and every so often after that. It's done when you can sticking a skewer into it and it comes out clean. I put foil over it for at least the first 3 hours to lock in the moisture. After cooling, I put it into an airtight container. Every few weeks I pour a little brandy onto it. I do this from anywhere between 1 and 8 months. I'm not going to go into details about applying the jam (used to 'glue' the marzipan onto the cake), marzipan and icing, as there are loads of videos on YouTube showing how to do that. This was my first ever cake| made for my then step-son (Edith's great-grandson). It's a bit lumpy and bumpy; this was before I discovered "icing smoothers" (see tips section below). 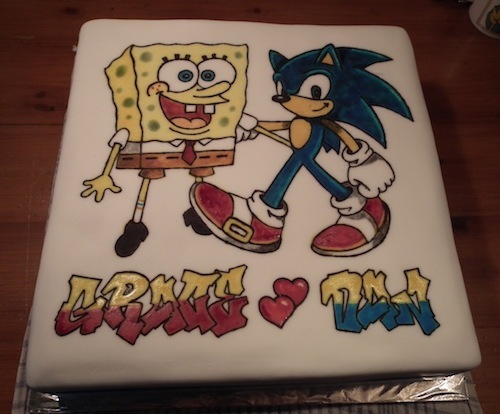 The controls on the cake were hand painted using a fine paintbrush and liquid food colouring. It was a bit of a rush job because, as this was my first cake, I really underestimated how long it would take to make the cake and add the marzipan and icing. 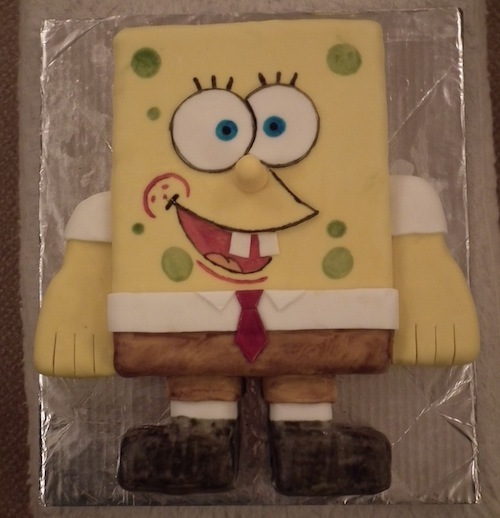 My second cake which was made for my then step-daughter (Edith's great-granddaughter) who, as you might guess, is something of a Spongebob fanatic. I used my 9" square tin and then cut up the cake to get piece for the arms and legs. I used yellow and white icing, everything else was hand painted with liquid food colouring. Additional pieces of icing were used for the eyes, nose, teeth, and top lip. My third cake; assembled from 2x 9" square fruit cakes to make a 12" square cake (one of the 9" cakes was cut into 3" strips... which left some over for my tea - nom, nom, nom). The design on the top is hand painted (I was getting the hang of it by now), but this time I used stencils (printed from my computer) to draw the outlines with a black food colouring pen. Then I filled in all the other colours using a paint brush and liquid food colourings. I purchased a heart shaped tin on eBay for this one. As the tin measures 15.5" from top to bottom of the heart and 14.5" across at the widest point, I had to double up the quantities of ingredients. 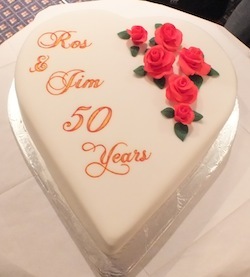 The roses and leaves were made from fondant icing after watching a video on youTube. I also had some DIY fun cutting the board on which it stands from MDF. Another cake made in my 9" square tin. The roses were done as before but this time I used a cutter for the leaves (much faster). Once again: the lettering was done with a food colouring pen after pricking though a print out with a pin. First of all, I dropped the cake getting it out of the oven to test it at the 3 hour point. Luckily it landed the right way up but a big gloop of the still uncooked mixture leapt out of the middle. Luckily (again) I was able to scoop the part that didn't touch the floor back in and all was well at the end of the cooking time. Next: I had to apply the icing on a hot summer's day... which was not good as the warm ambient temperature made the icing extra soft at the same time as drying out the surface. I had a heck of a time trying to get it on without splitting and smoothing it without the surface getting a crackle effect. 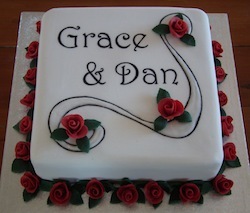 On to the roses... and another hot day resulting in the icing being too soft to work with. I ended up leaving it until midnight and working through until 3:30am so I could work in a cooler ambient temperatures. 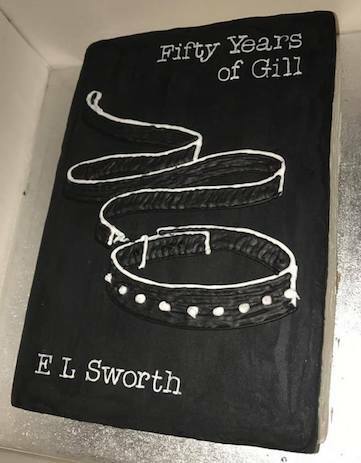 Finally, the swirly thing on the top was envisaged as a collection of three thin lines... but I messed up and ended up having to turn them into a 'tape' with a royal icing infill to hide my blunder. I hadn't initially envisaged it having roses on the top... but adding them was a stroke of genius: they work really well and take attention away from the swirly botch. As a result of the problems I had with the previous cake, it was a good while, about three years in fact, before I felt inclined to make another. But eventually I did, and this Drunken Santa cake for Christmas 2016 was the result. 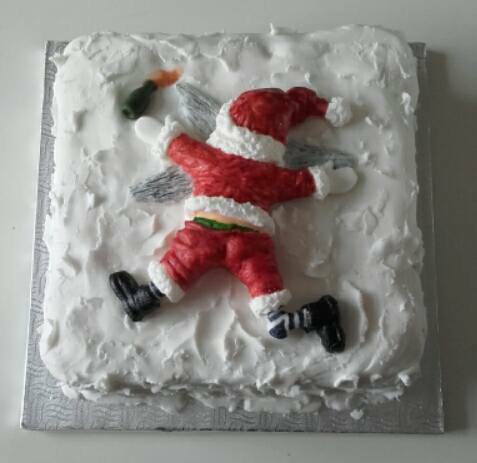 I found a (cartoon) reference image on the Internet and Santa was sculpted in situ from fondant icing. He was then painted with food colourings. A few months later I made this cake for my sister's 50th Birthday. She likes reading, loves dogs, and her surname is Elsworth. So the whole thing is a pun on E L James 50 Shades of Grey. I don't know if Gill has actually read it. I keep forgetting to ask. This cake saw me have another go at piping. I "cheated" with the lettering by doing it onto greaseproof paper with a template behind it, and I wrote it out about a dozen times. 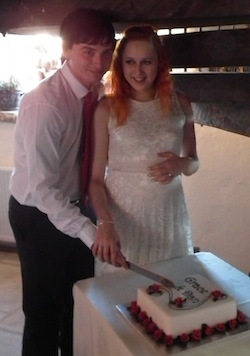 Then when it was set I chose the best letters and moved them onto the cake. I tried the same thing with the collar an leash... but it broke up while trying to get it off the paper. However, by this point I'd done enough work with the icing bag that I was getting the hang of it and felt confident enough to do the collar and lease directly onto the cake; so I did. Edith used to 'guestimate' the quantities so I don't worry about being 100% faithful if the quantity in the packet (usually sold in grammes these days) is a tad under or over what's stated in the recipe. The cake will rise a little in the middle while cooking so I usually hollow it slightly (we're talking about 1/2" in a 2 1/2" thick cake), to get a flatter result. Before applying the marzipan, fill any pea sized holes with a blob of marzipan first. To avoid touching the cakes while painting or decorating I have a 3" wide strip of wood, about 20" long, which I support over the cake on a couple of large coffee mugs; it gives me something to rest/steady my hand on.